On my way home I sent out a tweet to say that I was gutted to be missing Cisco Live this year but that I was hoping to be back next year. It was a fairly innocuous tweet but what happened next blew me away. 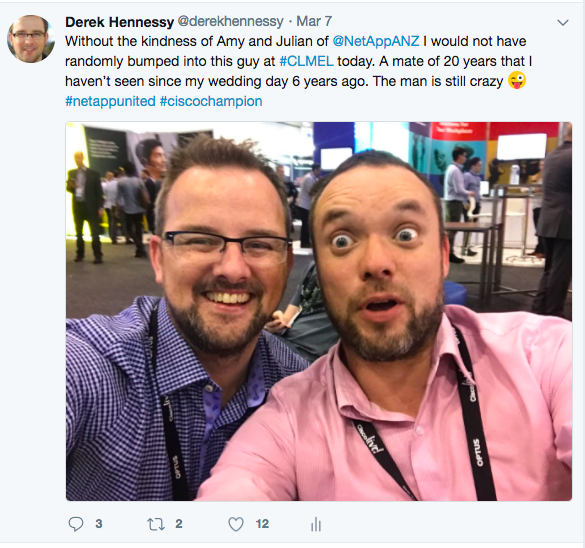 NetAppAnz tweeted back to me that I was on their VIP list and to DM them with my address to get some swag sent to my home address. I was humbled to be on any VIP list, let alone NetApps. I should add that I’m an active member of both Cisco Champions and NetApp United. My involvement in these programs and the work I do with the DCUG every month is what I believe led to a fortuitous sequence of events which have provided me with a life moment that will never be forgotten. 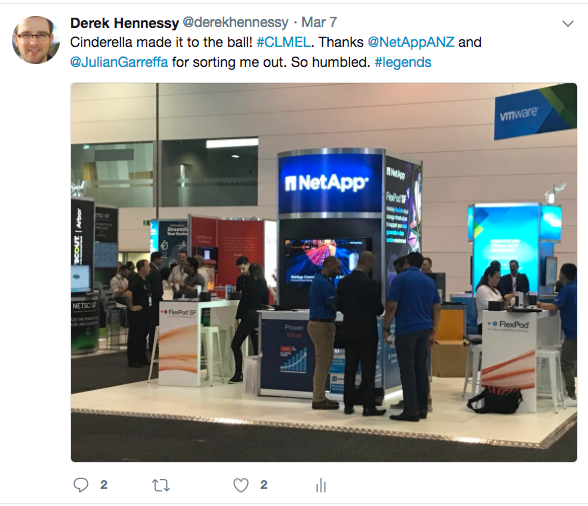 On Wednesday morning the community came to my rescue and following a quick call from my old NetApp SE I was getting into Cisco Live for the day. I thought my birthday had come early. And this is where my random encounters began. On my way into the conference center I ran into my old boss and another former colleague. I hadn’t seen either since I moved jobs almost nine months earlier. It was great to catch up and hear how everyone was and also to get the lowdown on where they were going as a company. Together we made our way in the convention center. Thanks to Amy Ngian from NetApp along with Julian Garreffa I had managed to get into the World of Solutions at Cisco Live for a few hours. I shuffled some meetings around which meant I had about 4 hours to play with before needing to be back at the office. I couldn’t believe it, I had made it after all. I spent about 15 minutes walking around the World of Solutions and really just chatted with the guys at the NetApp stand. I then arranged to meet up with Chris Partsenidis of Firewall.cx, a fellow Cisco Champion and my co-conspirator for the DCUG to discuss the previous nights event and to pick up some Cisco Champion swag together. While with Chris I randomly ran into another friend, Mark Ukotic. At this stage I thought I’d run into everyone that I was hoping to meet at Cisco Live. I left Chris as he had to go and study for his CCNP renewal exam. On my way back to the World of Solutions I spotted my old boss outside and made my way toward him when I heard someone shout out my name, clip my head and storm past me. To my utter shock it was my close friend from college, who I used to live with in Dublin and I hadn’t seen since my wedding day six year earlier. Jason lives in Auckland in New Zealand and has always been a hard man to track down so the fact that I met him was phenomenal. Serendipity played it’s part as I wasn’t even supposed to be at the event. I was absolutely floored to meet him and it was just a fantastic surprise. We spent the next couple of hours catching up and swapping stories on how life had progressed since we last met. It was the highlight of my year so far. I can’t thank NetApp, Amy and Julian enough for playing a part in getting me to Cisco Live this year. I still can’t believe how lucky Jason and I were to run into each other. Go community!! 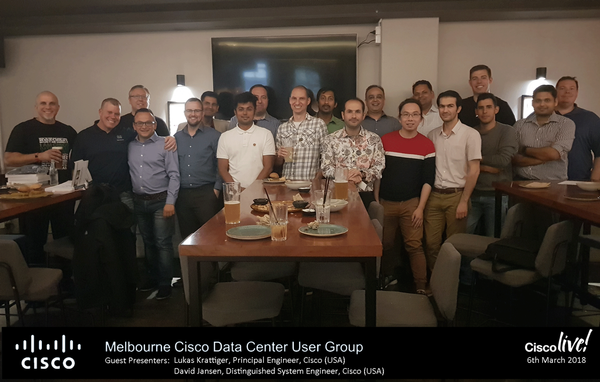 This entry was posted in Blog, Champion, Cisco Live, Community, NetAppUnited and tagged Cisco Champion, Cisco Live, Cisco Live Melbourne, CiscoChampion, NetAppUnited, vcommunity, vExpert. Bookmark the permalink.